Stucco is a form of thin cement that's used to texture indoor and outdoor surfaces. It creates a stony look when used on interior walls. It's a great solution for old plaster walls that are wavy, uneven and damaged, since the stucco itself is meant to look random and rough. Stucco in its natural state is cement-gray, but can be painted any color. Tinting the stucco toward the desired color in advance will make the painting go easier. Stucco is a form of textured cement. Use patching plaster to repair any cracked or crumbling areas. If there's gloss on the wall, de-gloss it by hand-sanding. Apply flat sealing primer over the whole wall with a regular paint roller. Open your bucket of stucco. Add wall paint to it to "tint'' it toward the color that you will be painting the room. 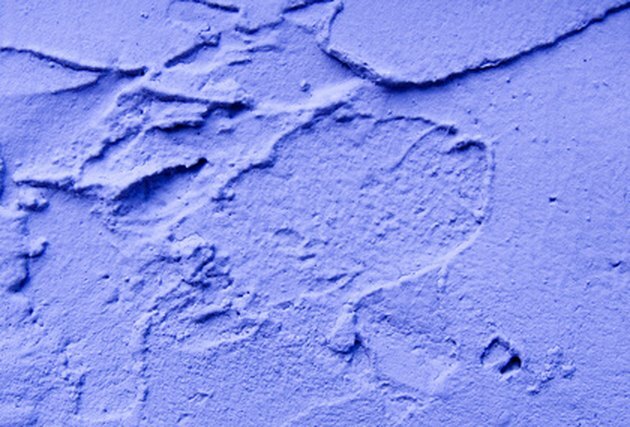 Use 1 cup of wall paint per gallon of stucco. Apply stucco to the wall, using your heavy roller and starting at the top of the wall. Spread enough to cover an area about the size of your arm-span. Make it as thick as you can get it on the wall without it sliding off. Press your trowel flat against the applied stucco, and pull it straight out. The motion will cause the stucco to ripple and peak. Move the trowel over, right next to the textured square you just made, and pull it out again, making another textured square alongside the first one. Repeat until you've textured the whole section of stucco. Roll another section of stucco onto the wall. Texture it with the trowel as before. Repeat until the whole wall it done. Let it cure for two or three days before painting.